The Life and Times of the Thunderbolt Kid: A Memoir (Hardcover) | Let's Play Books! Bill Bryson was born in the middle of the American century—1951—in the middle of the United States—Des Moines, Iowa—in the middle of the largest generation in American history—the baby boomers. As one of the best and funniest writers alive, he is perfectly positioned to mine his memories of a totally all-American childhood for 24-carat memoir gold. Like millions of his generational peers, Bill Bryson grew up with a rich fantasy life as a superhero. In his case, he ran around his house and neighborhood with an old football jersey with a thunderbolt on it and a towel about his neck that served as his cape, leaping tall buildings in a single bound and vanquishing awful evildoers (and morons)—in his head—as "The Thunderbolt Kid." Using this persona as a springboard, Bill Bryson re-creates the life of his family and his native city in the 1950s in all its transcendent normality—a life at once completely familiar to us all and as far away and unreachable as another galaxy. It was, he reminds us, a happy time, when automobiles and televisions and appliances (not to mention nuclear weapons) grew larger and more numerous with each passing year, and DDT, cigarettes, and the fallout from atmospheric testing were considered harmless or even good for you. He brings us into the life of his loving but eccentric family, including affectionate portraits of his father, a gifted sportswriter for the local paper and dedicated practitioner of isometric exercises, and OF his mother, whose job as the home furnishing editor for the same paper left her little time for practicing the domestic arts at home. The many readers of Bill Bryson’s earlier classic, A Walk in the Woods, will greet the reappearance in these pages of the immortal Stephen Katz, seen hijacking literally boxcar loads of beer. He is joined in the Bryson gallery of immortal characters by the demonically clever Willoughby brothers, who apply their scientific skills and can-do attitude to gleefully destructive ends. 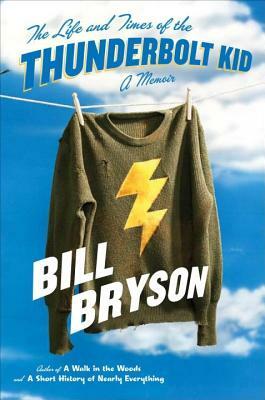 Warm and laugh-out-loud funny, and full of his inimitable, pitch-perfect observations, The Life and Times of the Thunderbolt Kid is as wondrous a book as Bill Bryson has ever written. It will enchant anyone who has ever been young. Bill Bryson's bestselling books include A Walk in the Woods, I'm a Stranger Here Myself, In a Sunburned Country, Bryson's Dictionary of Troublesome Words, and A Short of History of Nearly Everything, which earned him the 2004 Aventis Prize. Bryson lives in England with his wife and children.